AD-22/E is a robust LPDA antenna covering 700-2800 MHz, allowing for long range UHF / LTE communications, monitoring and jamming applications at up to 150 W CW. 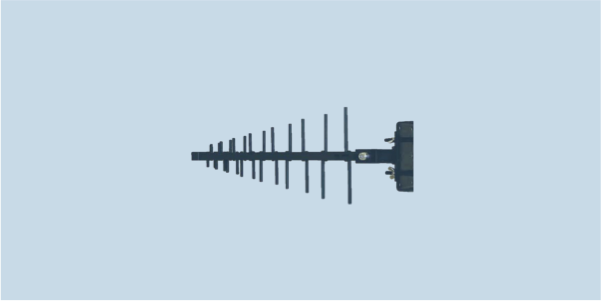 AD-22/E is a log periodic antenna covering frequency range of 700 to 2800 MHz. The antenna is composed of a boom element and 16 dipoles made from itridite finished aluminum alloy. The included antenna mount enables installation on masts of diameter between 1" (26 mm) and 2 3/8" (60 mm). All metal parts are painted with UV-resistant polyurethane paint for long term use at fixed sites or transportable applications. Explore our large selection of AD-22/E compatible masts.